Today is Earth Day, a celebration that began in the U.S. in 1970 and has since spread around the world. The event had an impact on environmental politics in subsequent years, but by some assessments, has been less prominent than in its early years. 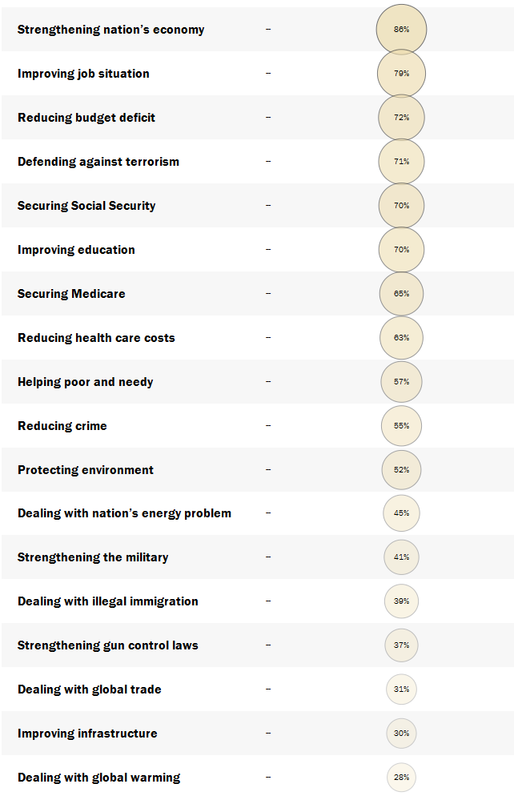 A Pew Research Center survey conducted in January asked Americans to name their top priorities for the president and Congress in 2013. Unsurprisingly, strengthening the economy (cited by 86%), improving the job situation (79%) and tackling the deficit (72%) were at the top of the list. A slight majority (52%) of Americans named protecting the environment as a top priority, putting it a little more than halfway down the list. This represented an 11 percentage point increase over 2009 but below the highs of 57% in 2006 and 2007. Nearly seven-in-ten (69%) Democrats named the environment as a top priority compared to 49% of independents and 32% of Republicans. One component of environmental concerns — global warming — got least support from the public as a pressing issue for the president and Congress, with only 28% naming it as a top priority.